"The environment in this Instruction Studio is beautiful and lends itself to peaceful concentration for learning and performance work". 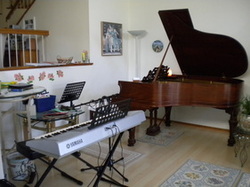 Piano lessons are available for children from the age of 6 and up, young adults, and adults of all ages. You will learn the art and the elements of singing, whether you are just beginning, or whether you have been singing for years and just want to 'brush up'. While for some singing is a natural 'gift', for others only a little instruction and direction is required to obtain a full and beautiful voice. Individuals, Managers, Executives and anyone who is required to present verbally in public, should spend a session or two at Studio "J". If you are timid or nervous about speaking, or your knees wobble when you have to make a presentation, a little effort and practice will make you much more comfortable, and much better prepared. I have been there, and I can help!